Newspaper editor, oil man. Born October 29, 1820, East Maria, New York. Died: February 5, 1915, Rockford, Illinois. 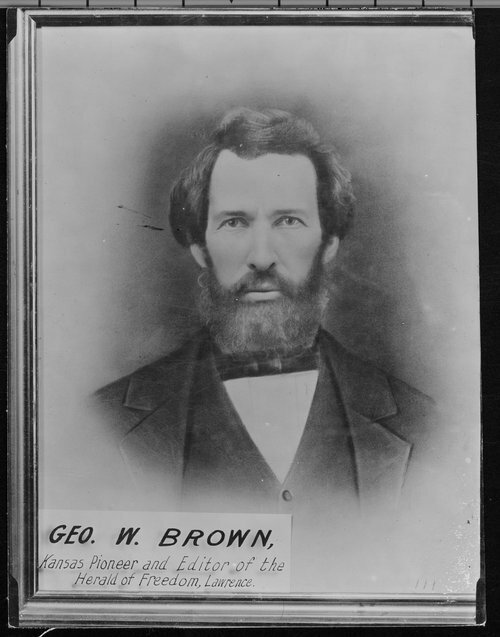 George W. Brown, who would become one of Kansas Territory’s most visible and controversial journalists, was born on October 29, 1820, in East Maria, Essex County, New York. At twenty-one years of age, he moved to Jefferson, Ashtabula County, Ohio, were he studied law. In 1840 he left Jefferson and went to Conneautville, Pennsylvania, where he finished his law course and was admitted to the bar at Meadville. After only a short time practicing profession, he decided to change career paths, turning his attention to the printing business. On November 14, 1846, he founded a newspaper he called the Courier in Conneautville, Pennsylvania, and as its editor, Brown endorsed the 1848 free-soil presidential candidacy of Martin Van Buren. Van Buren lost the election, but G. W. Brown continued to support the free-soil political platform through his newspaper editorials. On May 26, 1854, the Kansas-Nebraska Act passed the U.S. Congress. This act opened the territory to non-Indian settlement and reopened the slavery issue their. In the autumn of 1854 Brown decided to move to the new territory where he established a newspaper largely devoted to making Kansas a free state. Brown settled with a group of New England emigrants at Lawrence and by October had constructed a building and become editor of one of the first free-state newspaper in the territory, the Herald of Freedom, the organ of the New England Emigrant Aid Company. He devoted the newspaper to the interests of the company and the free-state cause, and it enjoyed wide readership and popularity among those Kansans supportive of a future state devoid of the institution of slavery. The newspaper soon angered the proslavery forces in the territory. 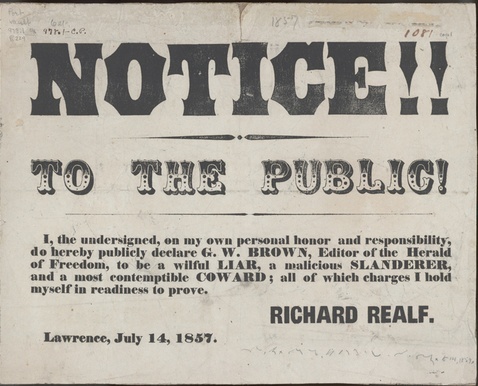 On May 21, 1856, a proslavery posse arrested Brown, and his newspaper office as well as other businesses in the town of Lawrence were sacked and burned by the notorious Douglas County sheriff, Samuel J. Jones. Brown spent four months incarcerated following an indictment by a proslavery grand jury for high treason. Later his case was dismissed without trial for want of cause for prosecution. Thereafter, he returned to Lawrence to rebuild his business and resume the publication of the Herald of Freedom. In the capacity of editor he served until the last issue of the newspaper on December 17, 1859. Brown’s interests included the founding of the city of Emporia and oil. In 1860 Brown drilled three wells in Miami County and began to extract oil there. In the capacity of oil producer he finally decided to leave Kansas in 1865 for the more lucrative oil fields of Pennsylvania. His stay in Pennsylvania was brief, however, and by the end of the year he had journeyed to Rockford, Illinois, where he decided to take up permanent residence. At Rockford, G. W. Brown lived the remainder of his long life, authoring histories about territorial Kansas and a biography about John Brown. The old editor died there on February 5, 1915, at the age of ninety-four.